General Motors rolled out the battery-powered Spark EV on Wednesday, marking the first time it has introduced an all-electric car since it scrapped the infamous EV1 a decade ago. The $25,000 mini-car-sized Spark EV will be targeted at US and Asian buyers and is expected to help GM meet California’s Zero Emission Vehicle (ZEV) mandate. It also reinforces a commitment to plug-in cars that GM has repeated over the last several years. “We’re taking what we’ve learned in the EV1 and the Volt and using it in the Spark,” GM spokeswoman Annalisa Bluhm told Design News prior to the rollout at the Los Angeles Auto Show. Bluhm added that 40 percent of the components in the Spark’s motor are used in the Volt motor and much of the Spark’s battery technology builds on lessons learned from the EV1 and Volt. The new five-door electric car will employ a 20-kWh lithium-ion battery from A123 Systems Inc. that will give the Spark “one of the best EV battery ranges in its segment,” GM said. With its 130-hp permanent magnet motor, it will go from zero-to-60-mph in eight seconds and will be the first vehicle to employ the new DC fast-charging standard from the Society of Automotive Engineers (SAE), which will enable it to reach an 80 percent battery charge in 20 minutes at public charging stations. Using a dedicated 240V home outlet, it will charge in seven hours. Inside, the vehicle will employ two high-resolution, seven-inch, color LCD screens; a MyLink radio for infotainment; and apps for navigation and global Internet radio. The vehicle’s 20-kWh battery is slightly larger than the Chevy Volt’s 16-kWh battery and smaller than the Nissan Leaf’s 24-kWh version. GM did not reveal the car’s all-electric range, saying that it is awaiting EPA estimates. The use of the A123 nanophosphate battery came as a surprise to some, given the fact that A123 filed for bankruptcy in October. 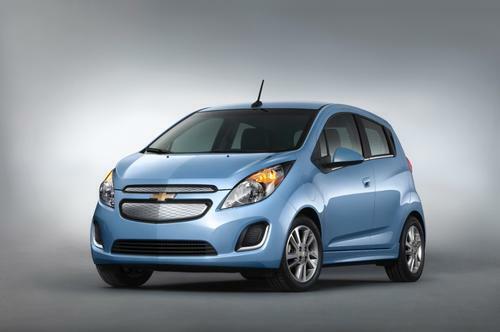 GM had said in 2011, however, that it planned to employ an A123 lithium-ion battery. “The bankruptcy proceedings have no effect on the development of the battery,” Bluhm told us. Since announcing the Chevy Spark in late 2011, GM has said the vehicle will be partially targeted toward buyers in Asia, where smaller vehicles are more accepted. “When you get into the mega-cities and the shorter driving commutes that they have in those regions, the Spark EV might be a better fit than a vehicle like the Volt,” a GM spokesman told Design News in 2011.